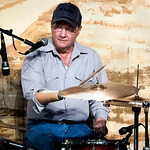 Al Roger and Louisiana Pride played Cajun favorites from Iry LeJeune, Aldus Roger, The Balfa Brothers, Sheryl Comier, Marc Savoy and other legendary musicians, past and present, during their performance at the Liberty Theater April 6, 2019. In addition to Al Roger on drums, the band included Joe Turner on guitar and vocals; Seth Spell on accordion and vocals; Haas Cormier on bass and vocals; and Travis Benoit on fiddle. Ray Landry hosted the show.